Secondly, this giveaway marks our very first giveaway (more to come), and we thought it would be fun to kick-start our giveaways with something celebratory. 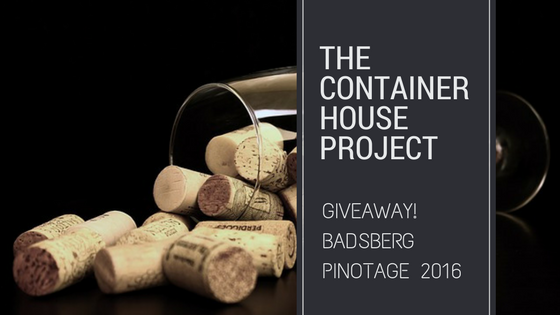 We are giving away one bottle of Badsberg Pinotage 2016. Badsberg wine farm is situated near Rawsonville (20 km from Worcester) and was established in the 1950s. Over the decades they have produced some fine wine and we enjoy dropping by when we are in the area. This particular wine recently won some prestigious awards, including the coveted General Smuts Trophy, and you can easily spend over R300 on a bottle if you want it decorated with several award stickers. (Buy it here). (NB: The prize bottle is not so decorated). Please note that this is not a sponsored post. We purchased this bottle of wine ourselves. This giveaway ends at midnight on the 31st of May 2018. The winner will be contacted the following week. Sign up for our free newsletter using the box below. We will never willingly share your details with anyone. Tell your friends about this blog & giveaway. You can use the share buttons at the end of this post.